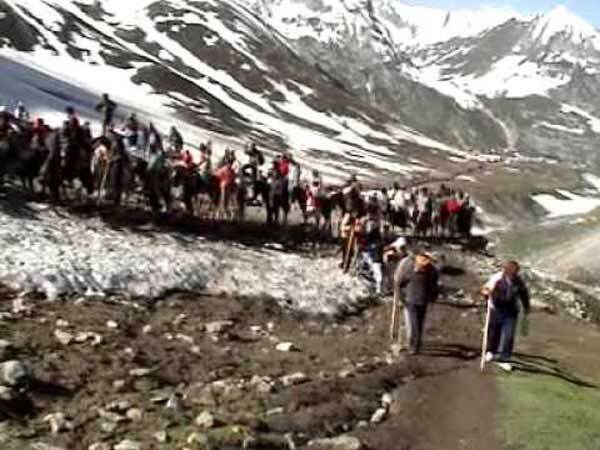 Pahalgam (Jammu and Kashmir) [India] : With the Amarnath Yatra set to begin from June 29, the Jammu and Kashmir Police on Tuesday said that they have put all the necessary security arrangements in place so that the pilgrims have a hassle free and secure journey. Acknowledging the security and law and order challenge in the state, adequate paramilitary forces, police and the Central Reserve Police Force (CRPF) have been deployed along the yatra route. "We have made sure that all the necessary arrangements have been put in place. As of now, 500 labourers of the Phalgam Development Authority are working in track clearance... we have made adequate preparations, the police, paramilitary forces, and the CRPF are adequate and on are job right now," Anantnag's Deputy Commissioner Syed Abid Rasheed said. "Whatever has to be done, it is being done on war footing," he added. Yesterday, Jammu and Kashmir Governor N.N Vohra reviewed the security preparations of the 40-day-long annual yatra to the holy cave shrine of Amarnath in Himalayas. He conducted aerial reconnaissance of Amarnath Yatra route, reviewed arrangements at holy cave, Panjtarni, Baltal and Domel camps. The Governor directed the DGP and the Kashmir divisional administration to strictly enforce the prescribed regulatory mechanism and ensure that only those pilgrims, who have valid yatra permits to be allowed to undertake the pilgrimage. The Shri Amarnathji Shrine Board (SASB), which conducts the annual pilgrimage to the shrine, has issued advisories for the pilgrimage which involves a trek at an altitude of 14,000 feet. The Indian Army has also deployed its five battalions in the Valley in view of the yatra. Deputy Chief Minister Nirmal Singh has also assured of proper security arrangements to the devotees, appealing to them to not to worry with the crisis along border regions.